These Picture Frames Include A Gravity Latch! 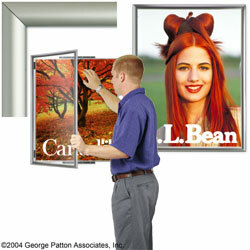 These Picture Frames Display 22" x 28" Posters Or Other Advertising Graphics! 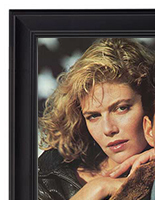 24" x 36" 30" x 40" 36" x 48"
This picture frame includes a permanently mounted backboard that will hold posters up to 1/16" thick. The total size of this picture frame is 23 1/2"w x 29 5/8"h x 1 1/4"d. The rounded aluminum outer frame is approximately 1" wide on each side. This product is engineered for interior use only. 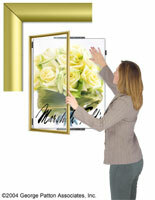 This picture frame comes fully assembled and is extremely easy to mount to your wall. 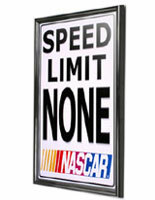 Exchange your 22" x 28" posters monthly, weekly or even daily in under 2 minutes with these rugged and professional frames. 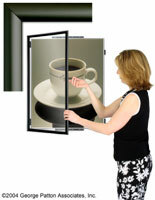 The 1" somewhat curved frame is ideal for framing posters, pictures, photographs, images and single-matted images. 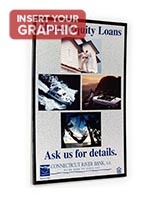 This high quality satin black aluminum picture frame gives your posters a extremely professional appearance and is outstanding for banks, retail stores, schools, and many other firms and establishments. 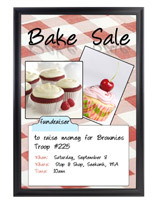 A durable and lightweight acrylic cover protects your poster. Each picture frame comes with reusable adhesive tape for holding your posters to the backing board. When the front wide face door closes onto your poster, it will overlap your poster by 1/4" all around.